The Launch application action can run any locally installed application and pass in predefined parameters. For example, your experience can call Windows Media Player and have it play a specific audio file whenever a particular button is pressed. 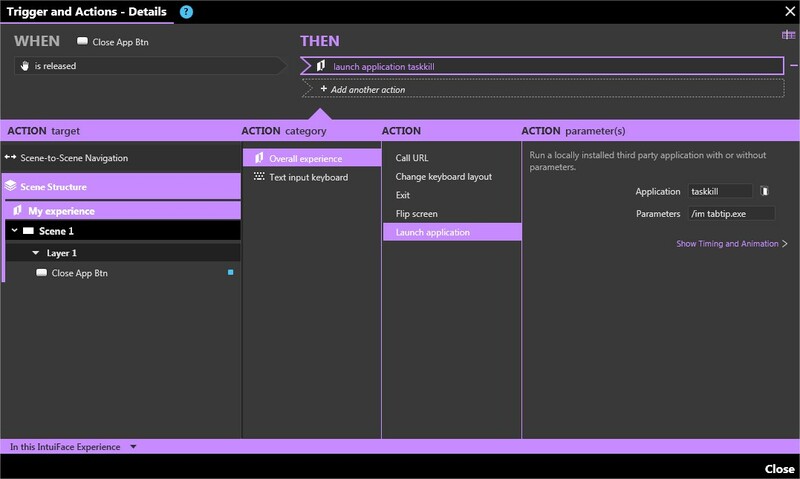 The Launch application action is only available in Composer and Player for Windows. By using the transparent background feature, you could make your third party application appear to be integrated in your Intuiface experience. Use of a transparent background would also make it easier to come back from the third party application to your Intuiface experience. in the "ACTION" column, click Launch application . Application: Enter the full path and file name of the executable you wish to run. You can either type it in manually or browse to the executable by clicking the Folder button to the right of this field. Parameters: Enter parameter names/values, if any. Separate each parameter with a space. If any value contains a space then it must be listed in quotes. The following example illustrates how to open Google Chrome with command line arguments such as position and size on the screen. Parameters: --chrome-frame --window-size=800,600 --window-position=580,240 --app="http://www.google.com/"
If a Web browser is already open outside of Intuiface, the Parameters values will be ignored if Launch application is used to run another instance of that Web browser. The Application parameter does not recognize system variables. However, a full path is not required for any application located in the folder C:\Windows\System32. Once you have opened a third party application, you can close it using another call to the Launch application action using the DOS command taskkill. For example, taskkill /im YourExeName will force the app YourExeName to quit. NOTE: Use of taskkill is a brute force method for exiting an application. Use it with caution. For more information about taskkill, see this Microsoft article. You can also wrap this command in a batch file (.bat) and launch the bat file itself. Some tools on the Web enable you to run batch files in silence - i.e. without showing the DOS prompt window.